Who is this Curly Mama? Disclaimer: As Maya Angelou says, “When you know better, you do better.” Before I get contrary comments, I’m coming out right now and saying that in terms of health and nutrition, there are situational exceptions. Not everyone has had the opportunity to learn these things, factors involving poverty, homelessness, etc. that I am not addressing here. I’m talking to the majority of us who haven’t taken the time to really be conscious of what we are feeding ourselves and our families, were taught but got lazy, or are tired of feeling like crap from eating food out of packages day in and day out. Here’s my theory: When it comes to food, we’ve been fed the line that “we are so busy,” that we “deserve a break today,” and that cooking from scratch is really hard, labor intensive, and time consuming. We just don’t have time to cook. I call a big fat B.S. If people really thought about it, or were taught how to cook, it wouldn’t be such a daunting task, and more importantly, we would be less apt to buy into the idea that we are just too busy. We’d know better. First off, tearing off the packet, pouring water in a bowl and nuking it in the microwave, takes all of 1 minute, plus 1 more minute of standing/cooling. Old Fashioned oats? They take all of 5 minutes. You’re saving a whopping 3 minutes. Seriously? Boiling water or heating milk and adding some old fashioned oats is super easy, and tastes better. Top with fresh fruit instead of fruit-like flavors made of who knows what. If you need a little sweetness, add some honey, cinnamon, or even a bit of brown sugar. It’s tasty, it fills you up with lasting energy (with no crash later), and it takes 5 minutes. Don’t tell me you don’t have 5 minutes in the morning. Drop the drive through Starbucks coffee and you have more than 5 minutes. First off, sugar is the second ingredient! (the higher up on the list an ingredient is, the more of it there is in the package). Creaming agent? What the heck? Gross! Partially hydrogenated anything – you don’t want! Partially hydrogenated=trans fats. 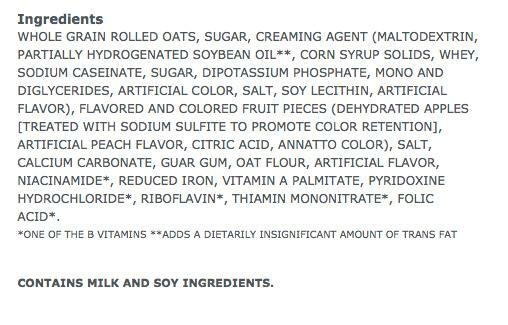 And you’ll notice they put a little note at the bottom that says it adds “an insignificant amount of trans fats”. These man-made chemical nasties in any amount are not good. Peach flavor? I thought this was supposed to be apples and cinnamon. Bottom line: if they aren’t ingredients you wouldn’t cook with in your own kitchen, chances are they aren’t that great for you. Put ’em back and grab the old fashioned oats. They’re better for you, they’re customizable, and no nasty ingredients! That list is HUGE! 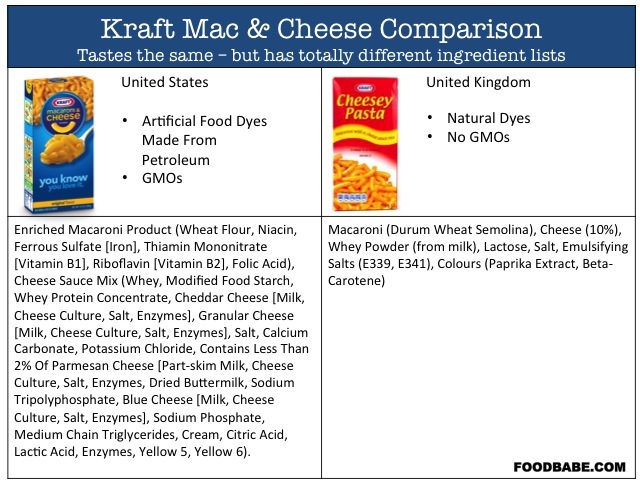 What is interesting is that currently, Kraft uses dyes (yellow 5 and 6) that have been shown to cause behavior issues with kids. (What’s shocking is that our kids aren’t glowing after eating the stuff! It’s nearly neon!) This stuff is really bad news. The same stuff sold in the U.K., not so much. Why? Why don’t we care about what we eat? Want to know how to make homemade macaroni and cheese? It’s easy! Boil the water, add noodles (buy whatever shape you like! ), cook and drain. To the warm pot, add 1-2 tbls of butter, 1/4-1/2 cup of milk, shredded cheddar cheese and the drained noodles. Stir! Yum! Easy! (If you want go for the gold, you can even pop it in the oven for 5 minutes on 400 or broil with a little shredded cheese on top and panko bread crumbs for crunch!) Add in some diced lean ham or turkey and some broccoli for a complete meal. It’s really just not that hard! Many convenience foods are like this. You can make them yourself at home, for about the same amount of time, but more nutritious and without ingredient lists that read like a chemistry text book. This doesn’t just apply to stay at home parents. Growing up, I know I was fortunate to have parents who cooked at home nearly every night. But you know what? They both worked full time. (For many years, they both worked multiple jobs, but still managed to put a meal together.) Again, it’s not just for the stay at home parents. Eating real food can be done. Don’t buy the lie that we are all just too busy. If we are too busy to eat – we’re too dang busy! Feeding ourselves is a life skill. We have to eat to survive! In my research, I came across a yahoo question from what I can only assume was young person (early teens, I’m guessing) preparing a meal for a 6 year old sibling. The question was, “How do I make oatmeal?” I’m not sure what I was more shocked at, the fact that he or she was unable to read the directions (again, I’m assuming this was a teenager), or the fact that he or she hasn’t been taught how to cook. Even if I hadn’t been taught how to cook at home, which I was, I learned quite a bit in my home economics class in school as well. How are we not teaching people to feed themselves? Am I alone in thinking this is crazy?! Most of us eat everyday, how do we not know how to prepare it for ourselves? It starts with us as parents. We need to teach our kids how to cook. We do them no favors by doing everything for them, or buying it out of a box or a drive through window. I'm Curly Mama! I'm a mother, a military spouse, and a dream chaser! When I'm not writing, mothering, working out, or wife-ing, I enjoy being with our three dogs and being outside! Grab a cup of coffee, have a look around, read awhile and let me know what you think!